The true definition of a ‘turntable hit’ is a song that received substantial radio airplay but failed to make the chart. Two good examples of this would be Van Morrison’s Brown Eyed Girl and The Eagles’ Life in the Fast Lane. This week’s subject was heavily championed by Capital Radio in the seventies – particularly Kenny Everett, and now receives a fair amount of play on Radio Two and one of two classic Matt Monro songs that never had a chart life. Who could believe that Born Free never graced the chart? And likewise for this week’s track, We’re Gonna Change the World. 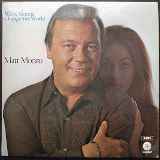 Matt Monro was born Terence Parsons in Shoreditch, London in December 1930 and had a tough upbringing because his father, Fred, died from tuberculosis when Terence was just three. His mother, Alice, struggled to cope with Terence and his five older brothers and in 1935 suffered a mental breakdown and went to a sanatorium. Terence was taken to a foster home where his behaviour let him down and eventually his mother came back to look after him. When he was 17 he volunteered for early enrolment and a couple of years later was posted to Hong Kong as a mechanic with the Royal Electrical and Mechanical Engineers. He got a taste for singing and entered himself into a radio talent show called Radio Rediffusion’s Talent Time show. He kept on winning and hence became a regular guest. The show’s host invited him to perform in a one-off show of his own on the condition he stepped down from the show to make room for other contestants, he agreed. Soon after, he returned to the UK to get a proper job, but his taste for singing had got the better of him. He met a girl and she became pregnant so Matt needed a job to support her and got a job as a lorry driver before switching to buses. He also began singing in various clubs in the evening. One guest who saw him perform was the Trinidadian-born chart-topping pianist Winifred Atwell who took Terence under her wing and persuaded her record company, Decca, to give Terence an audition. They were impressed and signed him. Terence changed his name taking the name Matt from Matt Black the first journalist who wrote a review about him and Monro from Winifred Atwell’s father Monro Atwell. The hits came thick and fast, Portrait of my Love reached number three in 1960, followed by My Kind of Girl in 1961 and Softly as I Leave You the year after. In 1963 he was asked to record the James Bond theme song From Russia with Love and, one of his finest songs, Walk Away, got to number four in 1964. Frank Sinatra once cited Matt Monro as irreplaceable and listed him as one of his favourite singers. Matt’s last UK hit was a vocal version of the chart-topping instrumental, Eye-Level which was re-titled And You Smiled in 1973. One of Matt’s last performances was in 1984 at the Barbican theatre in London, a sell-out night and one that was enjoyed and highly praised by all who attended and concluded with a seven minute standing ovation. It was later revealed by Matt’s daughter, Michele Monro that Matt was overcome with emotion and was one of his proudest moments. Later that year Matt became ill and died shortly after at the age of 54 from liver cancer. He said to me, “The song has been exceptionally good to me and has opened many doors. We were fortunate to be nominated for an Ivor Novello Award in the category Best Song musically and lyrically in 1970 but were beaten to the statuette by George Harrison with Something. So far as I’m aware I’m the only chartered accountant ever to be nominated for an Ivor!